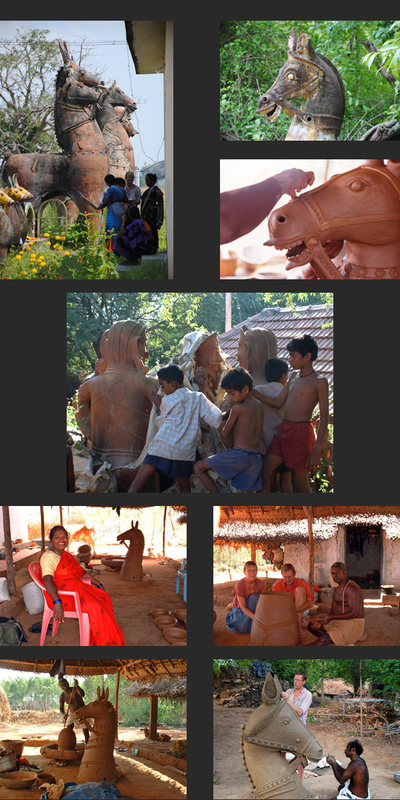 big monolithic ceramic sculptures as gifts to the god Aiyanar. sometime more than 5 m high, built in one piece and fired in situ. protecting it from fire, thieves, drought and illness. Besides horses common images are of elephants, cows, Aiyanar himself with his two consorts, Karuppan, Virapattirai etc. Aiyanar temples and get to know the potters/sculptors still making these fantastic terracotta sculptures. The photos on this side are also from these journeys.